Anyone can tell you that good hygiene is important. It has undeniable health benefits to it and it is also important socially. Most people are aware of the importance of hygiene because it is something that they were taught at an early age. But good hygiene should not only be practiced at home, it should also be maintained in the workplace. People spend many hours in their work and that means there are plenty of health hazards there that can be minimized with the good workplace hygiene practices. An important step towards ensuring good workplace hygiene is by including it in the employee health program. Although most people are aware as to why good workplace hygiene is important, sometimes they forget it or they feel that it’s inconvenient. That’s why they have to be reminded regularly. Some workplaces put people together in close proximity to each other. That increases the chance that they could get some kind communicable disease. Workplaces also have many common areas that are used by everyone. Those spots are touched or used by different people which increases the chance of germs being transferred. When workers get sick, that can have a negative effect on a business, so it’s crucial that you do everything that you can in order to ensure that they stay healthy all the time. Most health risks at the workplace can be minimised and avoided with the adoption of good hygiene practice among workers. Do not assume that because your workers are aware of the importance of these practices that they would do it all the time.They still have to be reminded. There are a lot of methods that you can use in order to remind workers about the importance of workplace hygiene. While some might think that more direct method such as requiring them to attend a lecture would be more effective, that might be counterproductive. You also have to think about how workers would respond to that. It might not sit well with some of them that they are being lectured about something as basic as hygiene. A less obvious way of reminding them is a better approach to take, something that isn’t so direct is going to be a better method. Using a poster is one of the best means of reminding people on why they should keep hygiene in mind even when they are in the workplace and it comes with many advantages. We all agree now that posters are great for raising awareness about workplace hygiene. Now, here are some of the top posters that you can actually use. These posters are downloadable and are ideal for printing. Germs do not travel on their on. They have to be carried from one spot to another and humans are usually the ones doing that for them. This poster is a fun reminder to workers that they should not contribute in spreading germs around. Diseases can be spread by the simplest of actions that we don’t really think much about. A simple sneeze for example can infect a lot of people. This poster can be used to remind workers that they should wash their hands right after sneezing. 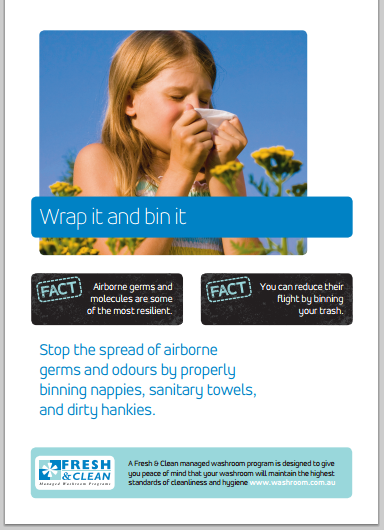 Nappies, sanitary towels and used hankies should be disposed of properly. This poster is a reminder that materials that might contain germs should be placed in proper containers where they will not come in contact with others. This poster is a reminder that materials that might contain germs should be placed in proper containers where they will not come in contact with others. Germs thrive in surfaces that are filled with moisture. This is why it is important to make sure that workers dry their hands after using the washroom. 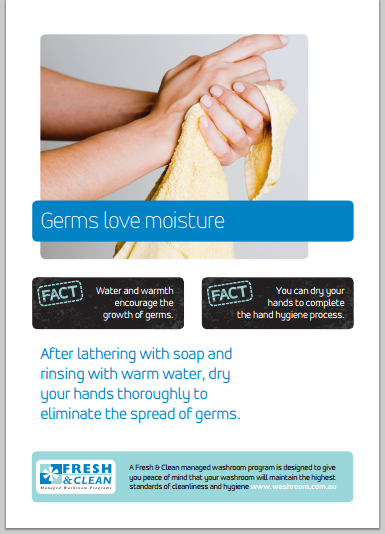 Germs should not be given a chance to thrive in wet surfaces. Hand contact is probably the main way that germs are spread in the workplace. It is not going to be possible to ban hand contact altogether so the next best thing is to make sure that hands stay clean all the time. 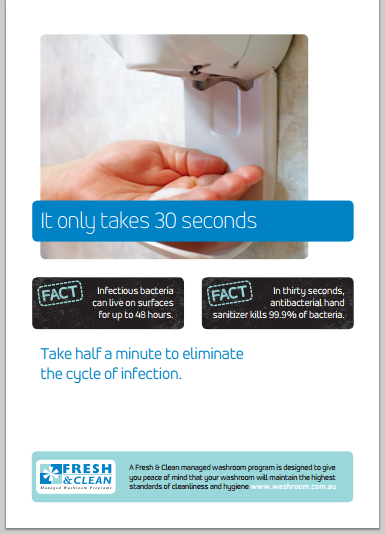 This poster reminds workers that it only takes half a minute for them to clean their hands using hand sanitisers. 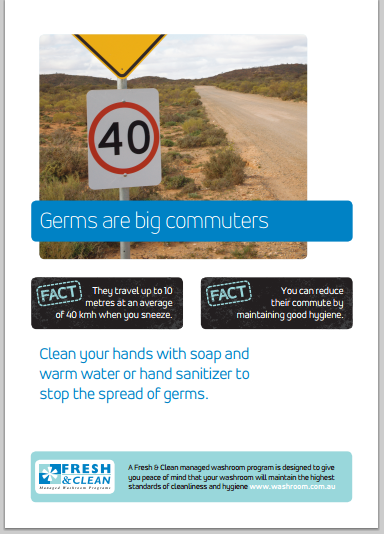 The use of posters can be an effective means of reminding workers of the importance of proper hygiene at work. Take care of your employees, maintain good hygiene in your workplace. 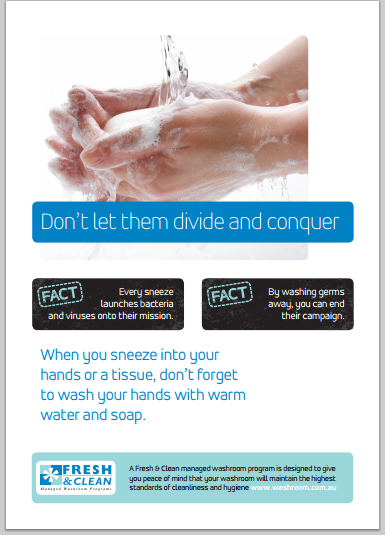 For more downloadable workplace hygiene posters that you can use in your workplace visit Fresh and Clean Hygiene Resources page now.